Rethinking Faith and Church: The Last Supper Remixed? I think Jesus was a bit sacrilegious himself (depending how you define religion) Using sacred ceremonial washing containers to make wine in... come on, He could have simply filled the empty containers from the wine that was running low. Maybe we make too much of certain symbols and consider them sacred. 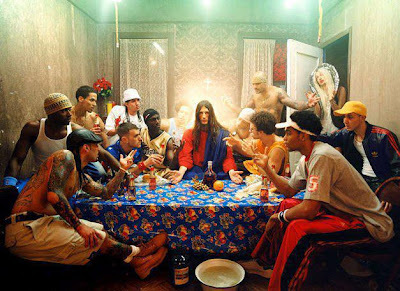 If we didn't consider this picture of Jesus and his crew having a meal together as a sacred religious icon, there would be nothing religious there for people to poke fun at. I'm with you though. I don't get the zombie stuff. Personally I think it doesn't fit with whatever is pure and lovely... those thoughts we should dwell on. So I don't get zombie humor... whether it is poking fun at religious icons or not. I was also thinking about how maybe the church itself is perhaps somewhat sacrilegious by taking the Lord's Supper, a "meal" shared in fellowship with the body of believers, and reduced it to a religious observance of a wafer and thimble of juice. Perhaps that's a blog post for another day. Thanks for sharing a comment, Jonathan. Peace.